Our Nana’s homemade pumpkin pie recipe has been handed down through a couple of generations from my husband’s grandmother. Great Nana could sure whip up the best pumpkin pie at Thanksgiving and Christmas. It’s an honor to share this recipe with you. So if you are looking for a special recipe to delight your family and friends during the holidays, give this a try. This pumpkin chiffon pie recipe has converted me to the chiffon style and I’ve never looked back. In fact, since I was first introduced to this fine lady and her savory pies, I’ve never had the desire to eat another traditional pumpkin pie. Try it and you may never go back either. Chiffon pumpkin pie is light and creamy with the addition of egg whites folded in, perfect after a large meal. And since this is an easy no-bake pie, it won’t take up precious oven space when cooking those holiday feasts. You can even save more time if you buy a store bought pie crust and cook according to package directions. Cool before adding the pumpkin mixture. If you prefer to make a homemade pie crust you can find my pie crust recipe here. Just scroll down part way to find it under “The Pie Crust”. This recipe will make two 9 inch pie crusts. Bake each pie crust for 9 to 11 minutes at 450 degrees and cool. In a small bowl, mix the Knox gelatin and water until blended and place in the refrigerator. In a sauce pan add the pumpkin, brown sugar, and the eggs. Stir until well mixed. Then add the evaporated milk, salt, nutmeg and the cinnamon. Cook for 10 minutes over medium high heat. Stir constantly. The mixture will thicken some. Remove the pan from the heat and stir in the Knox gelatin mixture until blended. Set the pan either in the refrigerator 15 minutes or until cool or in a pan of ice cubes to firm up. In another bowl, beat the egg whites, adding 6 tablespoons of sugar and the pinch of salt slowly while mixing. Beat egg whites until stiff. Fold egg whites into cooled pumpkin and mix well. 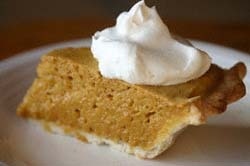 Pour pumpkin mixture into cooked pie crust and serve with whipped cream topping. This pie will keep well in the refrigerator for several days. In my opinion this makes the world’s best homemade pumpkin pie. Thanks Great Nana. Click here to watch my Pumpkin Pie Recipe video.